In First Bones, a prequel to Reichs’s first novel, Déjà Dead, she at last reveals the tale of how Tempe became a forensic anthropologist. In this never-before-published story, Tempe recalls the case that lured her from a promising career in academia into the grim but addictive world of criminal investigation. (It all began with a visit from a pair of detectives—and a John Doe recovered from an arson scene in a trailer.) The collection is rounded out with three more stories that take Tempe from the low country of the Florida Everglades, where she makes a grisly discovery in the stomach of an eighteen-foot Burmese python, to the heights of Mount Everest, where a frozen corpse is unearthed. No matter where she goes, Tempe’s cases make for the most gripping reading. Kathy Reichs is the author of nineteen New York Times bestselling novels and the co-author, with her son, Brendan Reichs, of six novels for young adults. 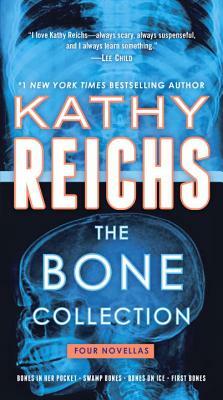 Like the protagonist of her Temperance Brennan series, Reichs is a forensic anthropologist—one of fewer than one hundred ever certified by the American Board of Forensic Anthropology. A professor in the Department of Anthropology at the University of North Carolina at Charlotte, she is a former vice president of the American Academy of Forensic Sciences. Reichs’s own life, as much as her novels, is the basis for the TV show Bones, one of the longest-running series in the history of the Fox network.